KANSAS CITY, Mo. -- If TCU’s monster upset of No. 1 Kansas was no accident, it sure was caused by one. KU stud freshman Josh Jackson was on the bench Thursday at the Big 12 Tournament, suspended for not telling his coach about leaving the scene of an accident 35 days ago . Yeah, it sounds weird and dumb and selfish that a typical college kid fender-bender five weeks ago helped create national headlines Thursday. Just don’t tell the Horned Frogs. Their 85-82 win in the Big 12 Tournament quarterfinals was the biggest in the program’s history. It was a result to tip toe around for both programs. To raise the absence of Jackson diminishes TCU’s effort. The Horned Frogs had lost seven in a row -- five of them by five points or less -- coming into the Big 12 Tournament. They won all the hustle categories Thursday -- rebounds (36-31), second-chance points (17-7), points in the paint (38-28). Hustle points? TCU point guard Alex Robinson broke an 80-80 tie with 30 seconds left driving straight into the mug of Player of the Year favorite Frank Mason for a layup. Kansas will still be some folks’ overwhelming favorite in the NCAA Tournament. They also must own a bad habit that has become their identity --- using the final five or 10 minutes to stage dramatic comebacks. This time the Jayhawks were down by 11 with 14 minutes left before rallying to take an 80-76 lead with 2:16 left. But eventually, it became clear the Jayhawks were worn down with only three players coming off the bench. All five starters played at least 35 minutes. TCU’s bench outscored the Jayhawks’ 34-3. “Josh would have made a difference on the offensive and defensive end,” said Mason who played all 40 minutes with Jackson creating a short bench. Everyone was holding their breath when TCU’s Desmond Bane rose from the corner for a 3-pointer with 2.5 seconds left. Kansas’ Svi Mykhailiuk definitely blocked the shot but he also definitely crashed into Bane after he did it. For a pregnant second it seemed that the officials might actually swallow their whistles in front of the pro-KU Sprint Center crowd. Bane sank all three free throws to win the game, breaking an 82-82 tie. TCU beat a No. 1 team for the first time. In the end, the eighth-seeded Frogs (19-14) played like they had to win. Kansas played like it merely wanted to win. After beating Oklahoma and KU, the Frogs are halfway to winning four games in four days to get the Big 12’s automatic bid. That has never been done. Lacking the same desperation, Self was talking openly about getting a few days off before what is expected to be a deep March run. Don’t tell Mason, who passed Paul Pierce on KU’s all-time scoring list with 29 points. There was no profound lesson for KU except perhaps for Jackson to be honest with his coach. The Jayhawks still likely roll into the tournament as a No. 1 seed, if not the overall No. 1 seed. In the moment, The Josh Jackson Effect in the Big 12 Tournament resulted in a one-and-done. The Jayhawks hope there is no carryover. “I’m disappointed he didn’t get a chance to play. He’s disappointed but I think he’ll respond favorably to it,” Self said. The Jayhawks have next 3 1/2 weeks to prove it. Kansas is the best team the country, but that doesn’t mean anything in the Big 12 tournament. There are plenty of teams that can knock off Bill Self’s Jayhawks -- and we found that out firsthand on Thursday. TCU, which lead by as many as 12 points before surrendering it late, came away an 85-82 winner to shake up the Big 12 tourney race. As it turns out, Kansas isn’t alone. Baylor joined the Jayhawks as an early ouster, falling to No. 6 seed Kansas State as a favorite on Thursday night. This is just the second time KU has ever lost in its opening game at the Big 12 championship. In 2009, Baylor did it. And now the race to win the title is wide open. The obvious team that benefits here: Iowa State. The Cyclones face TCU on Friday for a chance to advance to the finals. 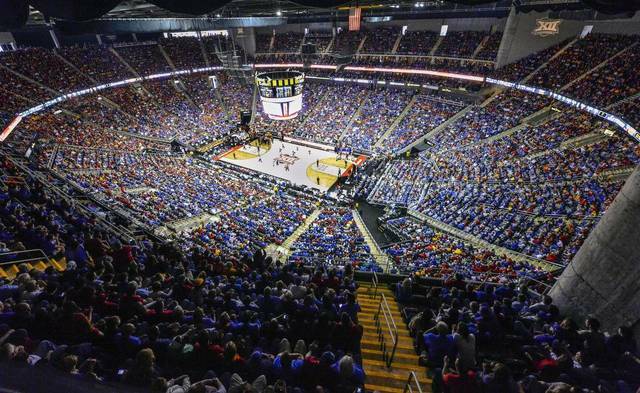 0 Response to "Big 12 Tournament: Kansas goes one-and-done, and it better fix this bad habit"